The Presbyterian Church (U.S.A.) recently elected its first African American Stated Clerk, J. Herbert Nelson. In the contest for the nation’s presidency, the first woman to be nominated by a major political party faces an opponent who grew up attending a Presbyterian congregation, though some inside and outside the denomination have questioned his Christianity. 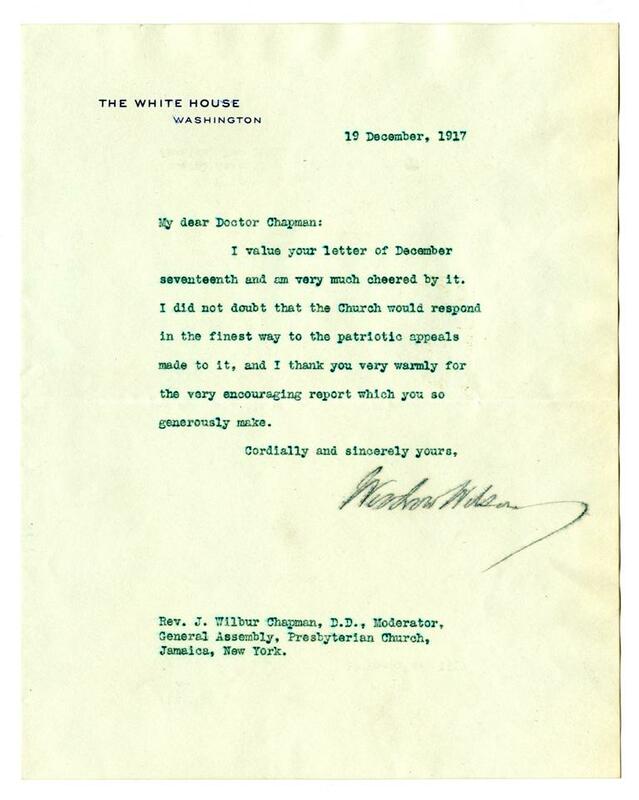 One hundred years ago, few doubted Woodrow Wilson’s Presbyterian faith. The son of Joseph Ruggles Wilson, Stated Clerk of the Presbyterian Church in the United States from 1865 to 1898, Woodrow Wilson was educated at the Presbyterian Church in the U.S.A.-affiliated Davidson College in North Carolina and later served as president of Princeton University in New Jersey. 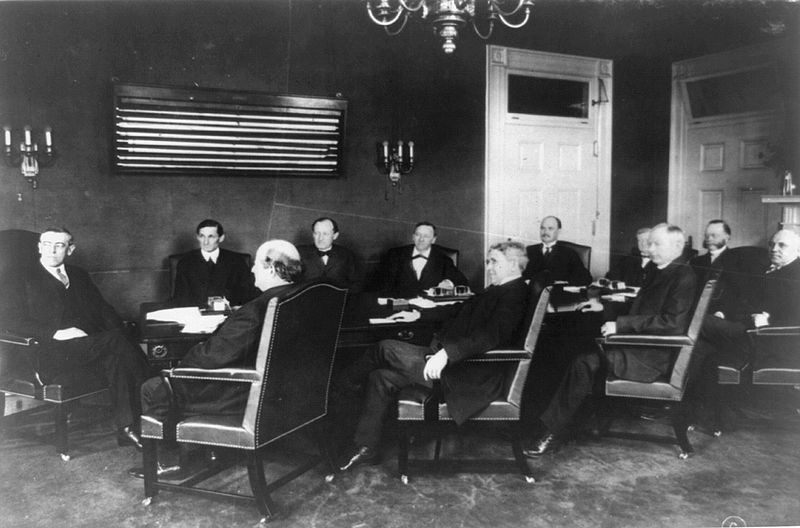 Presidential cabinet, 1913. Bryan faces Wilson to the left. Via Wikicommons. German Americans were especially keen on maintaining American neutrality, and both political parties courted their vote. One of Wilson’s strongest allies in persuading the public of his neutral intentions was fellow Presbyterian William Jennings Bryan. Bryan had served as Wilson’s Secretary of State until 1915, when he retired over what he considered to be Wilson’s heavy-handed treatment towards Germany after the sinking of the Lusitania. Still, in 1916 he campaigned for Wilson as a private citizen, and helped to steer many German Americans—especially those living in the Midwest—towards the Democratic nominee. In November 1916, Wilson and his Presbyterian running mate, Thomas R. Marshall, would win cities with heavy German populations such as Milwaukee and St. Louis. 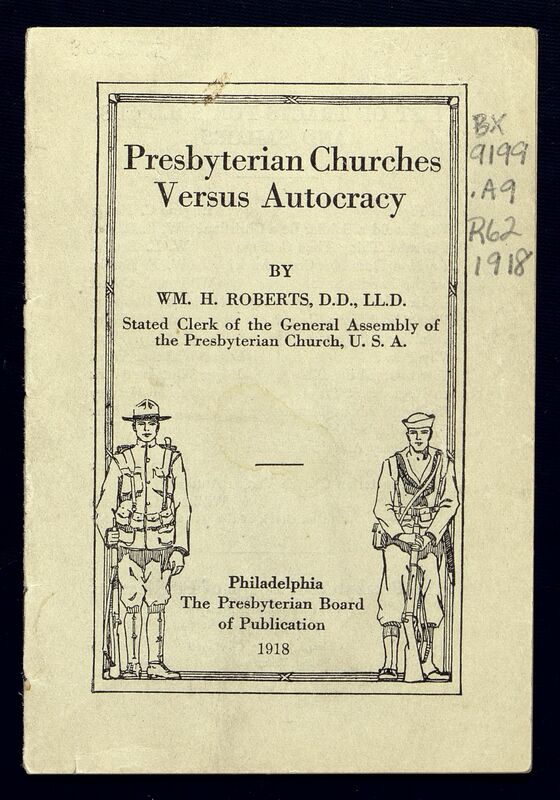 If the Minutes of the General Assembly of the Presbyterian Church in the U.S.A. are any indication, Wilson need not have worried about the Presbyterian vote. So adored was he by Presbyterians that a resolution was passed at the 1915 General Assembly in Rochester, New York, asking that God "continue to guide and sustain [Wilson]” and offering gratitude to God for “the wisdom and tact which have marked [Wilson’s] leadership of the nation during the trying days already past.” The General Assembly’s Committee on Resolutions of Thanks reported that “we are proudly thankful that at this crisis in American history we have at the White House, a Christian statesman, of equal firmness and self-restraint.” The committee pledged its sympathy, loyalty, and prayers to Wilson and his cabinet. The Church’s official position during that time of American neutrality was to push for a peaceful resolution to the conflict. Along with the Federal Council of Churches, it called upon President Wilson to declare a day of peace; letters including a peace hymn were sent out to 130,000 churches within the council. And yet many Presbyterians backed military intervention against the Central Powers of Germany and Austria-Hungary. Henry Van Dyke advised Woodrow Wilson against American neutrality. According to the book Preachers Present Arms, it was reported to the British that Charles Henry Parkhurst, pastor of Madison Square Presbyterian Church, claimed he had been defiantly anti-Germany since the war’s beginning. Pamphlet by the Stated Clerk of the Presbyterian Church in the United States of American in support of the war effort. In 1918, the Executive Committee of the General Assembly passed a resolution “to support in every possible way, and with all resources, the Government of the United States in the just and necessary war in which it is now engaged.” According to government data, only seven clergymen of the Presbyterian Church bucked the pro-war fervor by asserting themselves pacifists. One such minister, Edmund Chaffee, would later become head of New York City’s Labor Temple. On April 29, 1917, Chaffee and his co-pastor at Greenwich Presbyterian Church, William Fincke, delivered a sermon entitled “A Ministry of Reconciliation” in which they claimed they would not pray for the war effort but instead work for the peace of the world. Fincke also refused to allow the congregation to be used as a recruiting center. By May 1, the church session passed a resolution requesting the co-pastors’ immediate resignation. Fincke went on to serve in the medical corps in France and later worked again with Chaffee at the Labor Temple, as a pastor. Woodrow Wilson would complete his second successive term as president, the first Democrat to do so since Presbyterian Andrew Jackson in 1828. Widely remembered as a champion of international peace owing to his efforts on behalf of the League of Nations, his presidency has recently undergone increased scrutiny due to his role re-segregating the federal civil service. Presbyterian pastor and African American leader Francis Grimké, whom we are also highlighting this month, could have told you plenty about that a century ago. 2 hours 30 min ago. Happy #EarthDay from the Presbyterian Historical Society! Here is an image of the very first Earth Day in 1970 that comes from our collection of Religious News Service photographs. To view this image and read about the Presbyterian Church and it's involvement in environmental causes over the years, visit https://buff.ly/2GznHvN.